The first Tarawa (CV-40) was laid down on 1 March 1944 at the Norfolk Navy Yard, launched on 12 May 1945, sponsored by Mrs. Julian C. Smith, the wife of Lieutenant General Julian C. Smith, USMC, who commanded the 2d Marine Division at Tarawa; and commissioned on 8 December 1945, Capt. Alvin Ingersoll Malstrom in command. Tarawa remained in the Norfolk area until 15 February 1946, when she sailed for shakedown training in the vicinity of Guantanamo Bay, Cuba, and returned briefly to Norfolk on 16 April, before visiting New York in the latter part of the month. She arrived at Norfolk once again on the 30th. From then until late June, the warship completed her post-shakedown overhaul. On 28 June, she exited Hampton Roads bound for the west coast. Tarawa transited the Panama Canal early in July and reached San Diego on 15 July 1946. Following training and upkeep, she left San Diego for a deployment to the western Pacific. The aircraft carrier reached Pearl Harbor on 7 August and soon thereafter continued on her voyage west. She reached Saipan on 20 August and operated in the vicinity of the Mariana Islands until late September when she headed for Japan. After a stop at Yokosuka between 28 September and 3 October and one at Sasebo from 7 to 11 October, the aircraft carrier got underway for the northern coast of China. She arrived in the vicinity of Tsingtao on the 15th and operated in that area until the 30th when she headed back to the Marianas. On 7 November 1946, the carrier reached Saipan and, for the remainder of her Far Eastern tour, conducted operations in the Marianas. The only exception was a brief voyage to Okinawa and back early in January 1947, after which she departed Guam on the 14th to return to Pearl Harbor. The warship arrived in Pearl Harbor on 24 January 1947 and remained in Hawaiian waters until 18 February when she got underway for fleet exercises in the vicinity of Kwajalein. 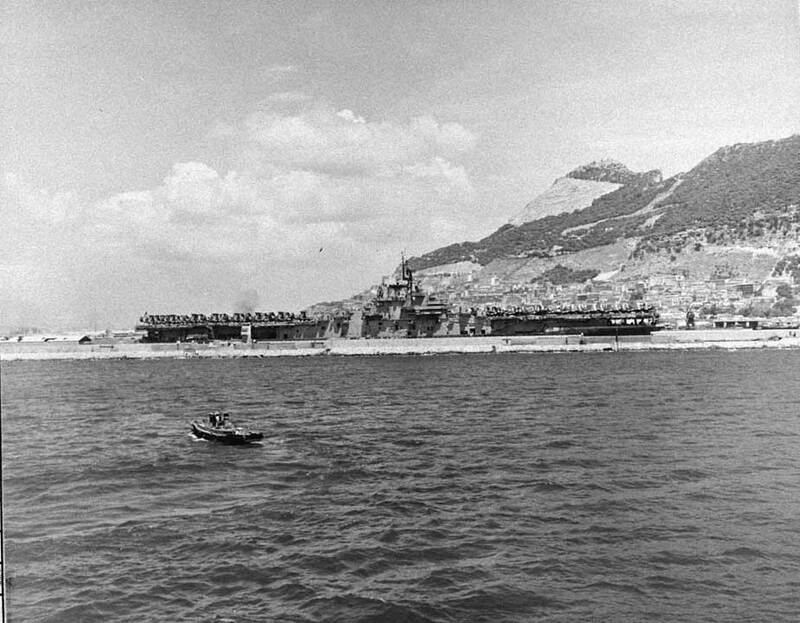 As a unit of Task force (TF) 57, she participated in battle practice attacks upon the carriers of TF 38 until early March. Tarawa returned to Pearl Harbor on 11 March for about a month, then headed for the west coast and arrived in San Francisco on 29 April. After more than 16 months of air operations out of San Francisco and San Diego, Tarawa stood out of San Diego on 28 September 1948 and embarked upon a cruise most of the way around the world. She stopped at Pearl Harbor at the end of the second week in October and then continued her voyage on to her first foreign port of call, Tsingtao, China. The carrier arrived there on 29 October and spent the next five weeks observing events in strife-torn northern China. Early in December, she headed south for liberty calls at Hong Kong and Singapore. The warship departed the latter port on 23 December and headed for the newly independent Republic of Ceylon, and arrived at its capital, Colombo, on 29 December 1948. Departing Ceylon on 2 January 1949, she steamed toward the Persian Gulf to call at Bahrain and Jidda before transiting the Suez Canal on the 20th and the 21st. Leaving Port Said, Tarawa continued her voyage to Greece, Turkey, and Crete. From Souda Bay, Crete, the warship headed across the Mediterranean on 8 February. She stopped overnight at Gibraltar on the 12th and 13th and then started out across the Atlantic. On 21 February 1949, she ended her voyage at Norfolk, Va. From then until early summer, the carrier conducted normal operations a long the east coast and in the Caribbean area. After inactivation overhaul, Tarawa was placed out of commission on 30 June 1949 and was berthed with the New York Group, Atlantic Reserve Fleet. Her retirement, however, lasted less than 18 months. On 30 November 1950, she was ordered reactivated in response to the Navy's urgent need for warships â” particularly for aircraft carriers' -to prosecute the war which had erupted in Korea the previous summer. On 3 February 1951, Tarawa was recommissioned at Newport, R.I., Capt. J. H. Griffin in command. Though reactivated in response to the Korean war, Tarawa never saw service in that conflict. Rather, she served as a replacement in the 6th and 2nd Fleets for carriers dispatched to the war zone. On 1 October 1952, she became an attack aircraft carrier, and was redesignated CVA-40. The warship finally made it to the Asiatic war zone in the spring of 1954, but long after the July 1953 armistice had ended hostilities. The ship returned to the east coast in September 1954 and resumed her normal operations. In December, she entered the Boston Naval Shipyard for overhaul and conversion to an antisubmarine warfare (ASW) aircraft carrier. On 10 January 1955, while still undergoing conversion, she was redesignated CVS-40. Her alterations were completed that summer and, after shakedown, the carrier operated around Quonset Point, R.I., conducting training missions with the ASW air squadrons based there. That fall, she participated in exercises with Hunter-Killer Group 4 before returning to Quonset Point to prepare for the 1956 "Springboard" exercise. Tarawa served with the Atlantic Fleet for the remainder of her active career. She remained on the east coast, operating out of Quonset Point and Norfolk and occasionally visiting the Caribbean area for exercises. In the main, her duty consisted of barrier patrols against the increasingly large Soviet submarine and surface fleet and assignments training pilots for the Atlantic Fleet. In May 1960, however, Tarawa's active career come to an end. She was decommissioned and placed in reserve at Philadelphia, Pa., where she remained until the late 1960s. During her retirement, she received one more change in designation when she became AVT-12 in May 1961. On 1 June 1967, her name was struck from the Navy list; and, on 3 October 1968, she was sold to the Boston Metals Corp., Baltimore, Md., for scrapping.